Alessia Pagliaroli graduated with a Masters Degree in Communication at Siena University in Italy. She then began a successful career in recruitment with Randstad in Frosinone, Italy where she was responsible for all steps associated with the identification, placement and performance of contract employees. 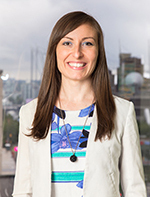 In 2014, she moved to Canada and joined Goldbeck Recruiting. With over 13 years of experience in the recruitment industry, we are fortunate to have Alessia on our sales recruitment team. She now is a Senior Recruiter at Goldbeck and handles placements in Marketing, Engineering, Construction Management, Consumer Wholesale, Technology & IT Sales, Supply Chain & Logistics. Alessia takes a consultative approach with all her placements. She feels that, as a recruitment specialist, she is the “eyes and ears of the market” for both the client and candidate. She enjoys bringing value to her clients by being completely transparent, knowing the industry, and providing a competitive point of view. She takes pride in knowing that she is able to find the best candidate for some of the hardest to fill positions. She also finds fulfillment helping candidates take steps towards a positive career change.